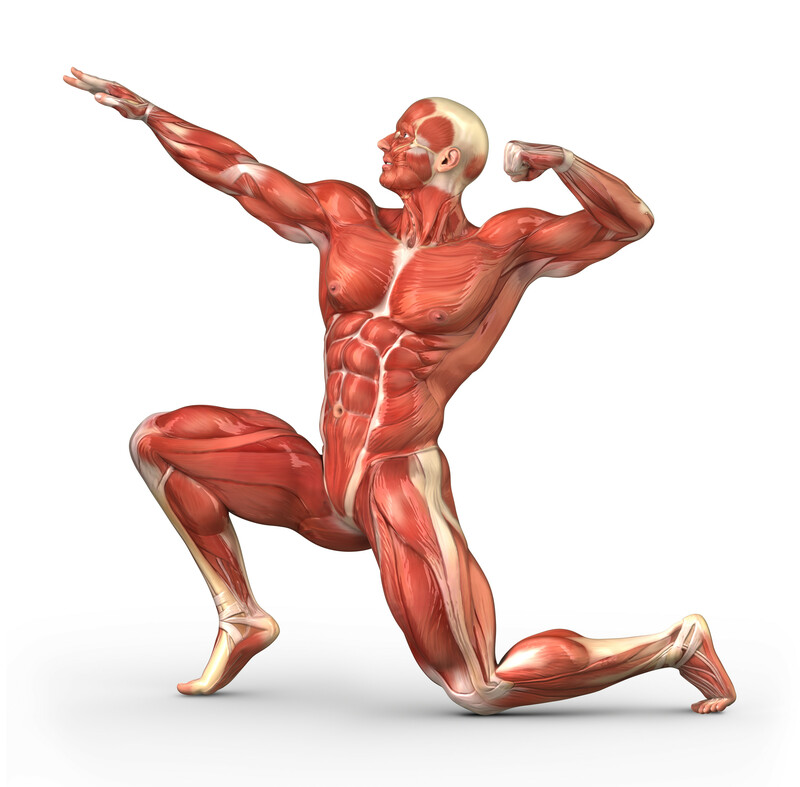 Some basic anatomical knowledge will come in handy at this point; and by understanding how the different muscle groups respond to varying stimuli, not only will you safeguard yourself against injuries down the road, but the more likely you are to continue to remain in the black in regard to your goals in the weight room. The first thing you need to understand if you truly want to maximize your efforts in the weight room is that different muscle groups are made up of different muscle fibers. Type 1 muscle fibers are responsible for longer duration, lower intensity activity; they respond best to higher rep ranges, lighter weight, and more frequency. Type 2 muscle fibers are responsible for shorter duration, high intensity activity; and they respond best to lower reps, more weight, and less frequency between efforts. The above is critical to understand when designing your strength program, because if you are consistently training muscle groups with incorrect loads, rep ranges, or frequencies, you will cease to see results; and your time invested in the weight room will far exceed any gains—you may even injure yourself down the line! That is precisely why I am about to break down each muscle group for you in terms of muscle type, and then explain which exercises, rep ranges, and loads they respond to best. Traps: The traps are predominately a Type 1, or slow twitch, muscle group; they respond best to lighter, more frequent loads, in the 8-20 rep range. This is one exercise where I see dudes at the gym do the exact opposite of what they should do: they grab the heaviest weight they come across and proceed to bang out anywhere between 5 and 10 reps with horrible form and irregular tension throughout the exercise; they also have small traps, so go figure. My favorite exercises for this muscle group would have to be all Farmer Walk variations for 30-60 seconds per set, Face Pull variations for sets of 12-20, and all Dead-lift variations. Shoulders: The deltoids are made up of a 50/50 split of both fast (Type 2) and slow twitch fibers; they will respond best to both heavier loads for low reps and lighter loads for high reps. 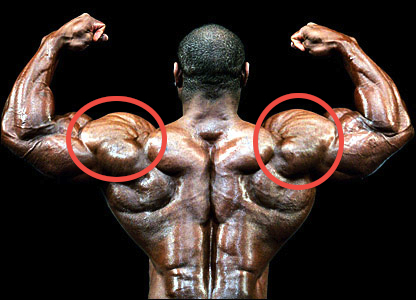 The deltoids are made up of three groups: the anterior, middle and posterior delts. The anterior (front) part of this muscle gets plenty of work from all pressing variations: both horizontal and vertical; and this is where you can go heavy: in the 5-10 rep range. The Band Pull Apart is also a tremendous exercise for the rear delts and maintaining shoulder health. Chest: The chest is made of predominately fast twitch muscle fibers; it responds best to heavier loads. My go-to here is an Inclined Dumbbell Press for sets of 6-12 reps— focus on maintaining maximal tension throughout the entire exercise, and look to increase the weight used over time. While progressive overload in lower rep ranges will give you the most bang for your buck with this muscle group, let’s face it, if you want to stay healthy and injury free, you’ll have to vary your exercise selection, loads, and frequencies: you can’t train heavy all the time! For this reason, I recommend “going heavy” with your presses just 1-2x per week; and then getting the rest of your muscle development from body-weight exercises like Push-Ups and their many variations: I love Suspended Push-ups from rings, a TRX, or a Jungle Gym XT in the 8-15 rep range, as they combine the push-up with the chest flye, and, if done correctly, yield amazing results. Arms: The biceps, triceps, and forearms are all predominately slow twitch muscle fibers; they’ll respond best to lighter loads with maximal tension in the 8-20 rep ranges. If you’ve been reading my work, you’d know that the typical bodybuilding split will not work for the average guy. If you’re still dedicating days of the week to individual body parts and you don’t look like The Rock, it’s time to switch it up and train more intelligently. That said, biceps, triceps, and forearms will get the majority of their stimuli from training the bigger muscle groups. Therefore all you really need is one or two exercises at the tail end of an upper body session to finish them off. For biceps, I like a standing, Alternating Dumbbell Curl for sets of 10-15, maximizing the tension throughout the entire set and never relaxing the muscles—even at the bottom of the rep.
For triceps, I’m a big fan of the Rope Pushdown, as this implement allows for a bit of instability and a better “squeeze” at the bottom— aim for sets of 10-20; and also focus on maximizing tension throughout the exercise. For direct forearm development, I love all Farmer Walk variations and Reverse Ez-Bar Curls— aim for sets of up to 60 seconds on the farmer walks and sets of 10-20 reps on the curls; I also recommend avoiding straps of any kind for the majority of your pulling exercises. Back: The back is made up of a mix of both fast and slow twitch muscle fibers; it will respond best across all rep ranges and loads. For the rhomboid area (mid to upper back), I like Chest Supported Neutral Grip Rows and Cable Rows. For the Lats, I like Chin-ups for vertical pulling and 1 Arm Dumbbell Rows for horizontal pulling. For the lower back, I like 45 Degree Back Extensions and Reverse-Hypers. If you are able to execute them correctly, all Dead-lift variations will tax the back in it’s entirety. Mix it up and aim to hit the back across all ranges, multiple times per week. Abs: The abdomen are made up of both fast and slow twitch fibers; they respond well across all rep ranges and loads. I wrote an entire post on my top 5 ways to train them, already. Quads: The quadriceps are also made up of a pretty even split between the two types; they’ll respond best across all loads and rep ranges. The Back Squat has been referred to as the “King Of All Exercises;” and as far as strength building is concerned, you’d be hard pressed to find another exercise that compares—especially in the lower, 5-10 rep range. That said, not everyone has access to a squat rack and/or can execute them safely or effectively, therefore, I recommend Split Squat variations in the 8-12 range for the majority of people. In the 10-20 range, nothing beats a Goblet Squat when it comes to annihilating this muscle group. Glutes: The Glutes are predominately a slow twitch muscle group; they will respond best with lighter loads in the 8-20 rep range. For this muscle group I love any type of Bridge/Hip Thrust variation. Reverse Lunges, Step-Ups, and High Rep Kettlebell Swings are all great as well. 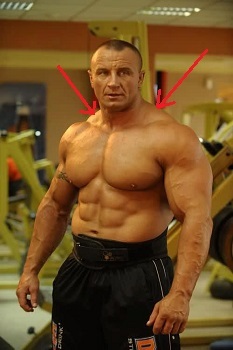 The mind-muscle connection is extremely important with this muscle group; and so it’s extremely important that you visualize the muscle contracting with each and every rep—I personally like to hold the “squeeze” for 1-2 seconds at the top of each of these lifts, especially on the bridges and hip-thrusts. Hamstrings: The hamstrings are fast twitch muscles; they respond best to heavy loads and high intensity. Nothing builds these bad boys up more than Dead-lifts (in all their variations), 45 Degree Back Extensions, Glute-Ham Raises, Body-Weight Leg Curls, Plyo-metrics, Heavy Kettlebell Swings and Sprints. Needless to say, if you’re still using a leg curl machine to train this muscle group, you probably have weak hamstrings, bruh. Calves: The calves are a slow twitch muscle group; higher frequencies will work best on them. The easiest way to train this muscle group is to Jump Rope for 5-10 minutes before each and every training session. This will kill three birds with one stone: giving you the stimulus needed to train this muscle group properly, sneaking in some cardio into your program, and serving to warm your body up for some heavy lifting. Aside from jumping rope, Sprints and Plyo-metrics will go a long way in developing this muscle group. If you must do Calf Raises, keep the weight light enough to complete sets of 10-20, and make sure you can maintain tension throughout the entire exercise, squeezing for a full 1-2 seconds at the top portion of the lift. If you want to take your training to the next level, I strongly insist that you incorporate this information into your programming. I see men and women walk into the gym every single day and completely waste their time. In some cases, they are actually doing more harm than good; and they would, without a doubt, be better off staying at home, as they are paving the way toward an injury by using improper technique, wrong exercise selection, and the wrong loads and frequencies in their training sessions. Take the time to learn about your body and how it functions. Train intelligently, systematically, and diligently. If you don’t have the time to learn this stuff on your own, hire yourself a trainer. The Law of Diminishing Returns pertains to all areas of your life, not just your pocket book. Take pride in everything you do; and take the time to inquire, learn, and master your life—training included. If you would like to incorporate these exercises correctly into a training program based on your individual needs and goals, you can email me at j.j.valdivia.23@gmail.com—I’m currently taking clients for online coaching.